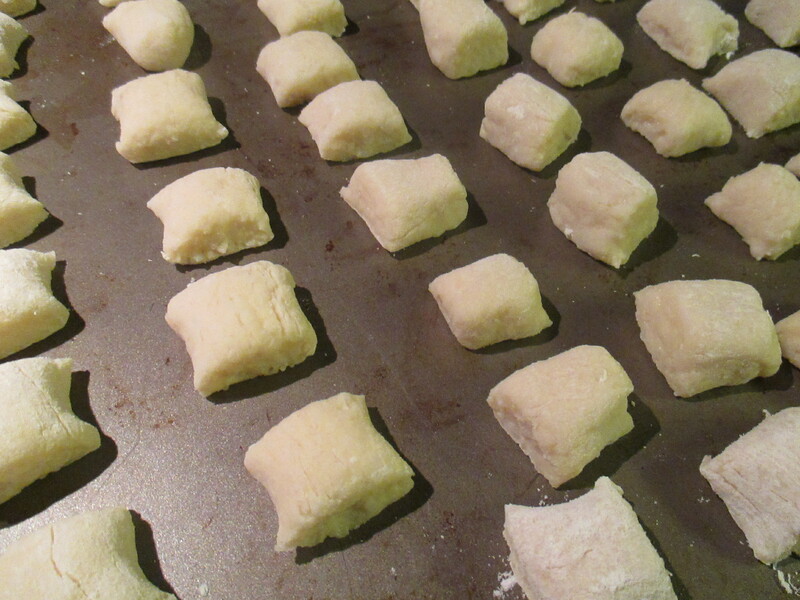 I’ve been wanting to make Gnocchi for quite some time. Not really sure why though because I’ve only had it once or twice. I think it’s the challenge of it all… Can I really make it? One thing that was holding me back is that most recipes call for a potato ricer. Something I don’t own and was reluctant to purchase. I went to a couple of stores and couldn’t find one and truthfully didn’t want order one online. I did find a few recipes that said you could mash the potatoes but then I found some recipe reviews that said mashing the potatoes wouldn’t turn out good gnocchi. And then, I found a recipe that used a large hole grater and I was ready to go. To make the dough I baked 3 medium Russet potatoes at 400 F for about 45 minutes. I let them cool for a few minutes, then peeled them and grated them using the large holes of a box grater into a large bowl. I added in a lightly beaten egg and salt and then added in flour, a little at a time, until the dough wasn’t sticky. 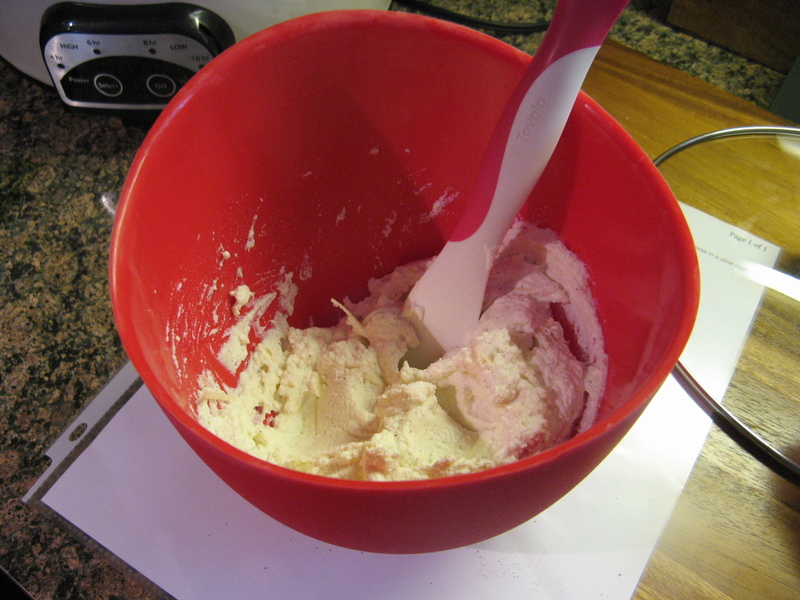 I then dumped it out on a lightly floured surface and kneaded it. 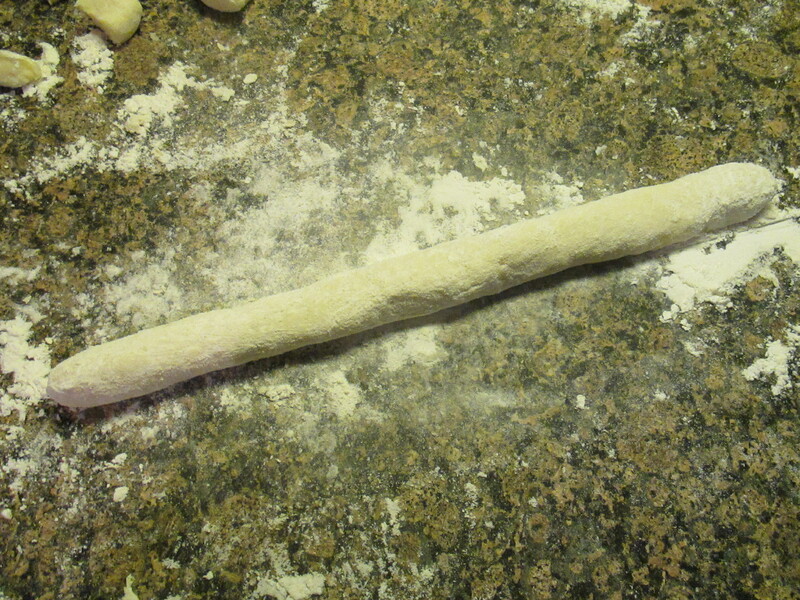 Next, I divided the dough into 6 smaller balls and rolled out each ball into a rope about 3/4-inch thick. 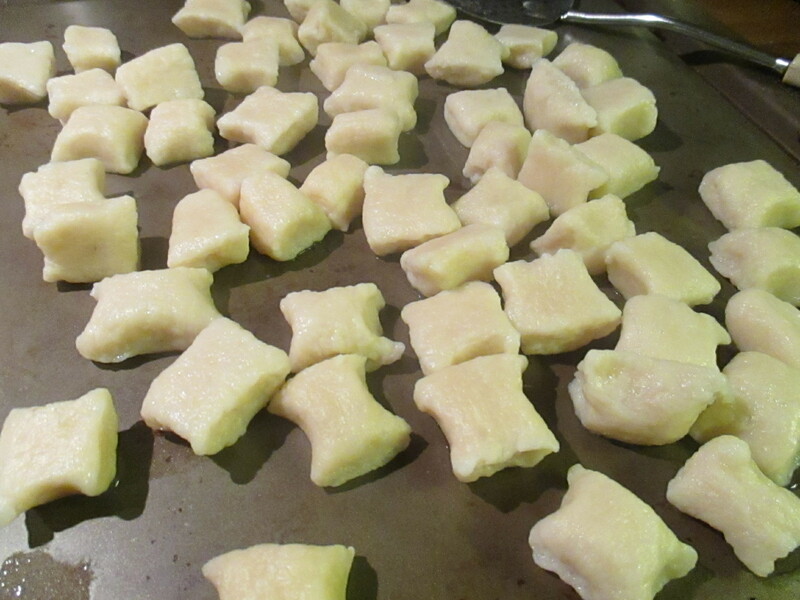 I then cut the dough into 1-inch pieces. Once I had rolled out all of the dough and cut it. I boiled them in a pot of well-salted water. I knew the gnocchi was ready once it floated to the surface of the water. Next, I finished off the gnocchi in a mushroom sauce. And here’s the funny thing about this… the first day it tasted good, the 2nd day it was delicious, but, on the 3rd day not so much. 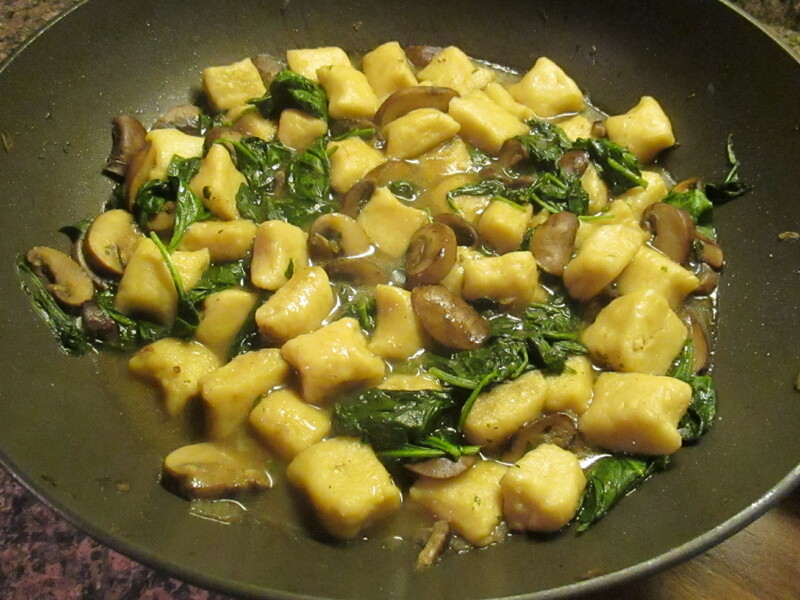 I think by then the gnocchi had absorbed a lot of the sauce and it just turned an odd color and the flavor was off. So, apparently homemade gnocchi is good for 2 days and that’s it. Preheat the oven to 400 F. Prick the potatoes all over with a fork and place on a baking sheet and bake for 45 – 60 minutes, until the potatoes are fork-tender. Flip the potatoes halfway through the baking time. Let the potatoes cool slightly. 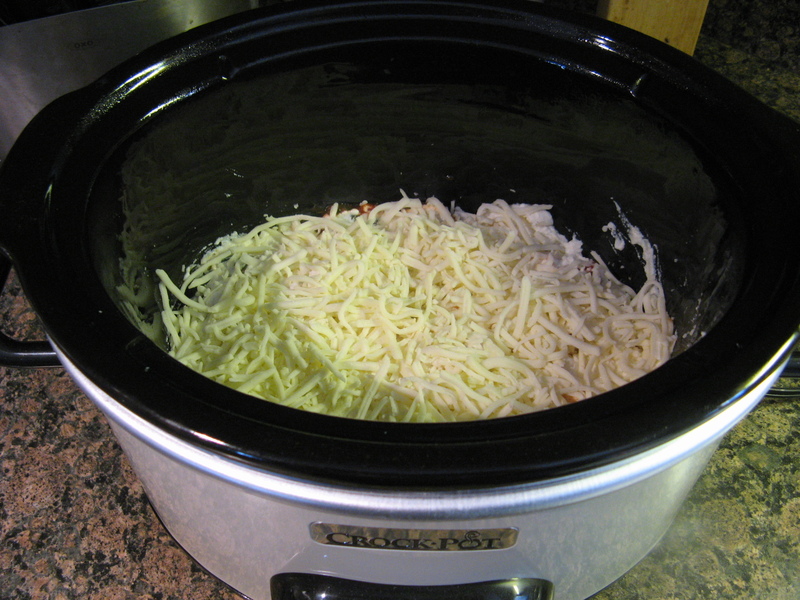 Peel the potatoes and then grate them over the large holes of a box grated over a large bowl. Add the egg and the salt and mix well with a wooden spoon. Add the flour to the potatoes, a little at a time, using only as much as you need so the dough doesn’t stick to your hands. When the flour has been incorporated dump it and any remaining floury bits onto a lightly floured surface. Knead the dough. 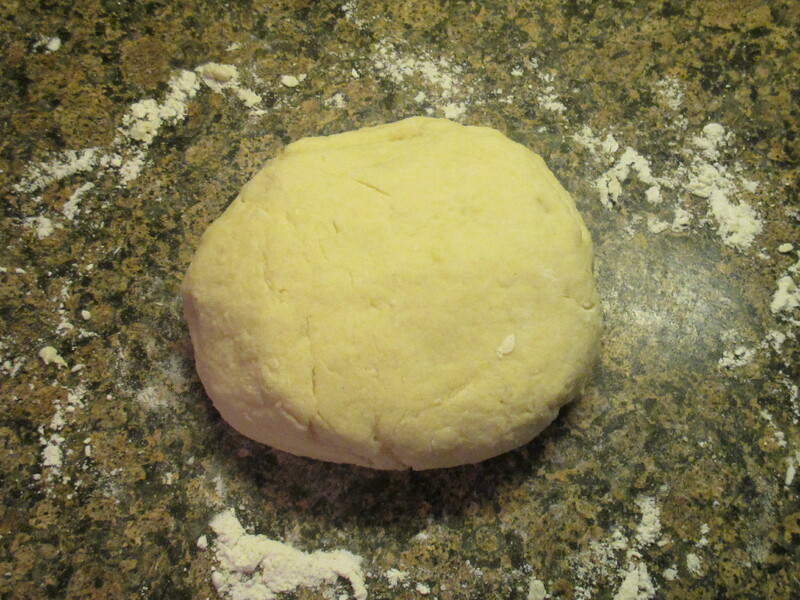 Press down and away with the heel of your hands, fold the dough over, make a quarter turn and repeat. Knead for about 3 to 4 minutes. Form the dough into a ball and then divide into 6 smaller balls. Using your fingertips roll each ball into a rope about 3/4-inch thick and cut into 1-inch pieces. 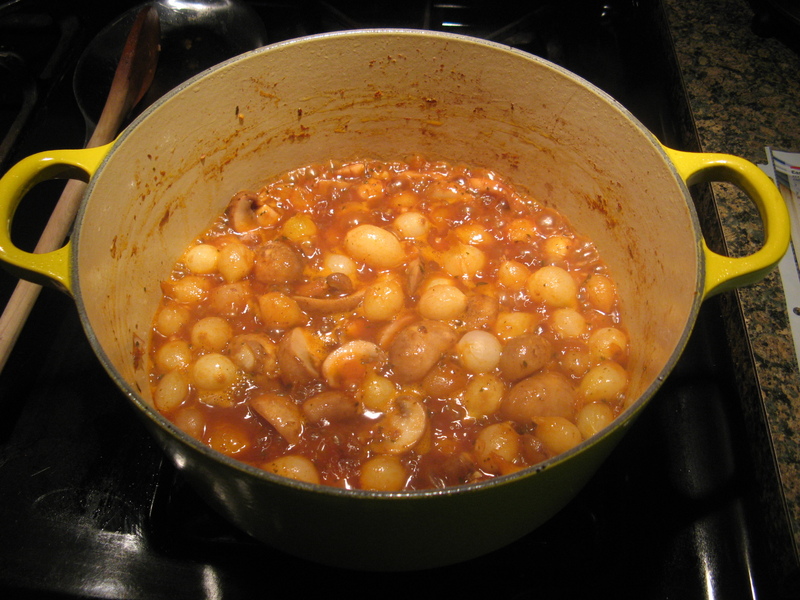 To cook, bring a large pot of salted water to boil and add the gnocchi in batches. Once it rises to the surface remove from the water and set aside on a baking sheet. 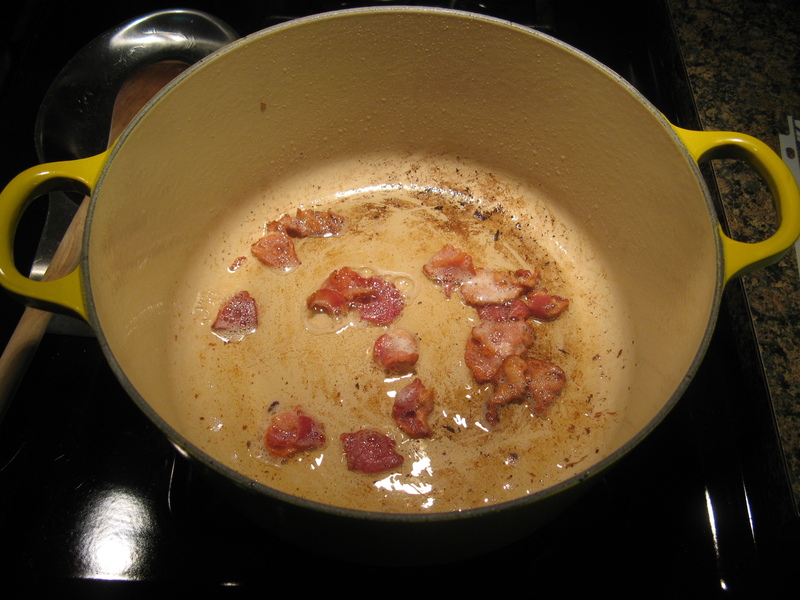 Cook the butter and olive oil in a large skillet over medium heat until the butter begins to brown. 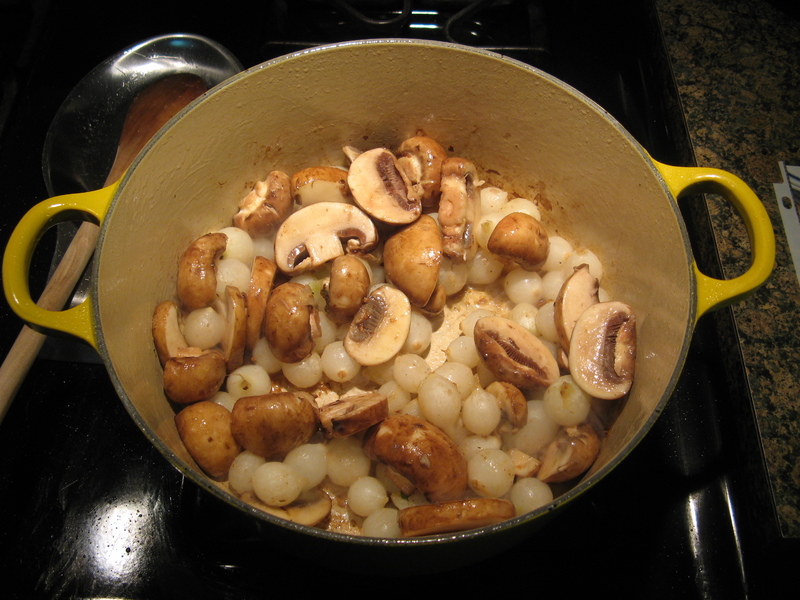 Add the mushrooms and shallots and sauté until golden brown, about 10 minutes. Add the chicken broth and parsley; simmer until the liquid is slightly reduced, about 8 minutes. Season to taste with salt and pepper. Add the gnocchi and cook until heated through, about 1 minute. Add the spinach and stir until wilted. Divide among bowls and drizzle with parmesan cheese. 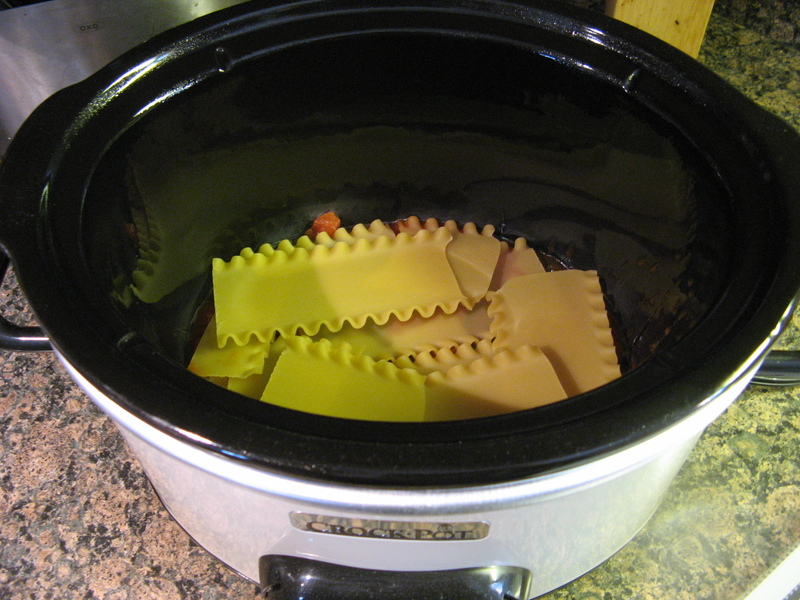 I love lasagna; I just don’t like all the work that goes into it. It can be time consuming and making sure the noodles don’t tear while boiling them always deters me from making it. 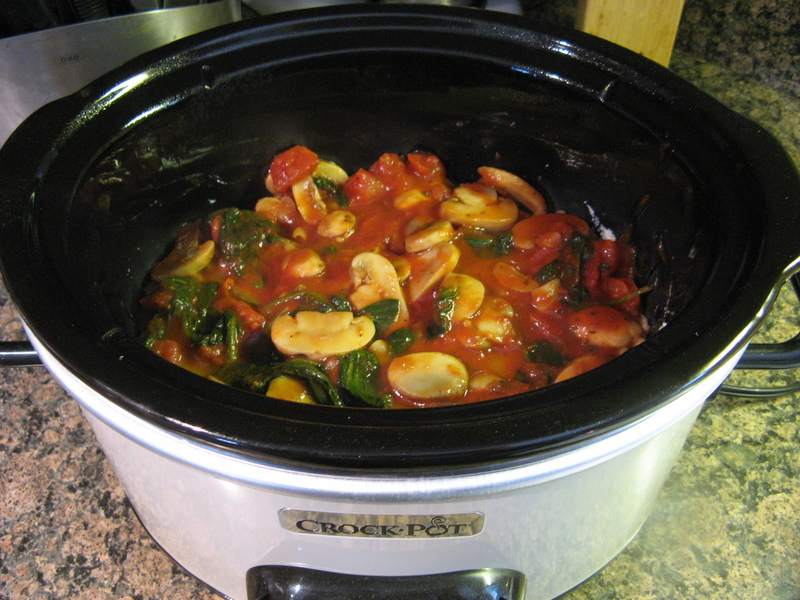 But those road blocks are gone since I found a winning recipe to make in my slow cooker. 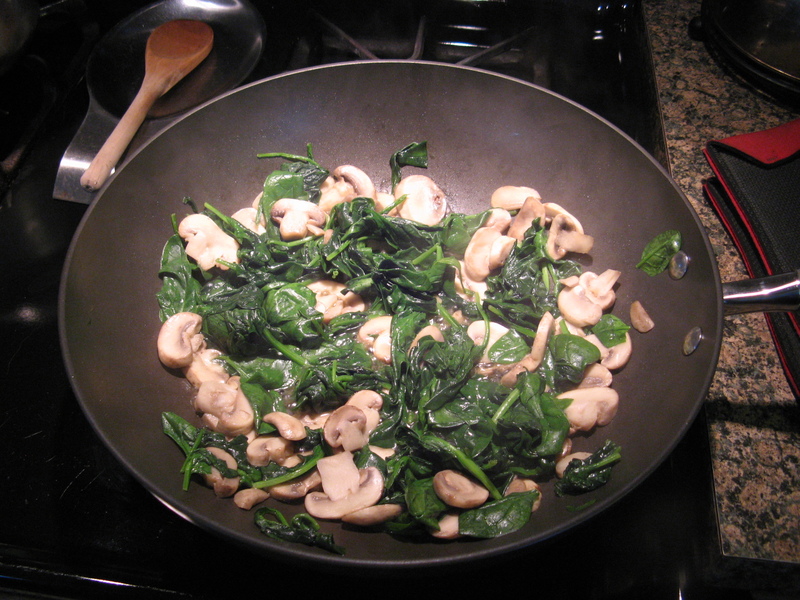 To begin, over medium-high heat I sautéed mushrooms in olive oil for a few minutes and then added in baby spinach and continued sautéing until the mushrooms were tender and the spinach had wilted. Next I added in diced tomatoes, tomato sauce, Italian seasoning and salt. Once the mixture began to boil I lowered the heat and let it simmer for a few minutes. Meanwhile I combined ricotta cheese, shredded parmesan cheese and pepper in a small bowl. And topped it with another 3/4 cups of the sauce, the ricotta cheese mixture and 1 cup of shredded mozzarella cheese. I then topped the cheese with another 3/4 cup of the sauce and the remaining 3 lasagna noodles and finally the remaining sauce. After covering it and cooking it on low for 5 hours I topped it with the remaining mozzarella and parmesan cheeses, covered it once again and let it stand for an additional 5 minutes until the cheeses had melted. 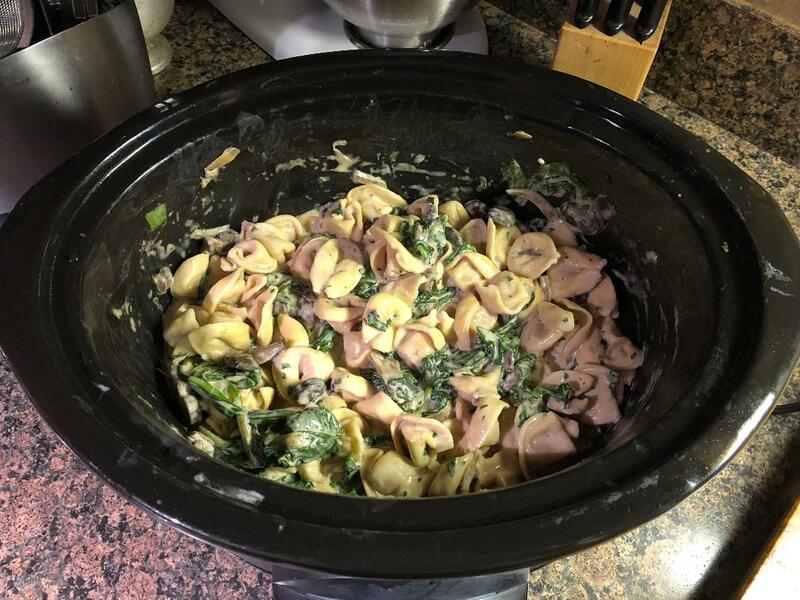 And while it was delicious, unfortunately it didn’t stay together when I tried to cut it out of the slow cooker. Oh well! Taste wins over plating sometimes! 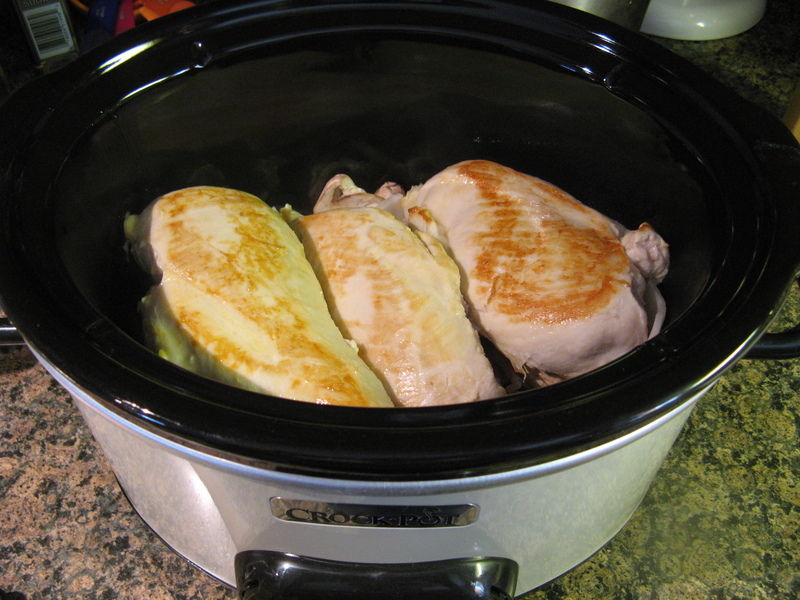 Spray the inside of a 4-quart slow cooker with the cooking spray. Heat oil in a large skillet over medium-high heat. 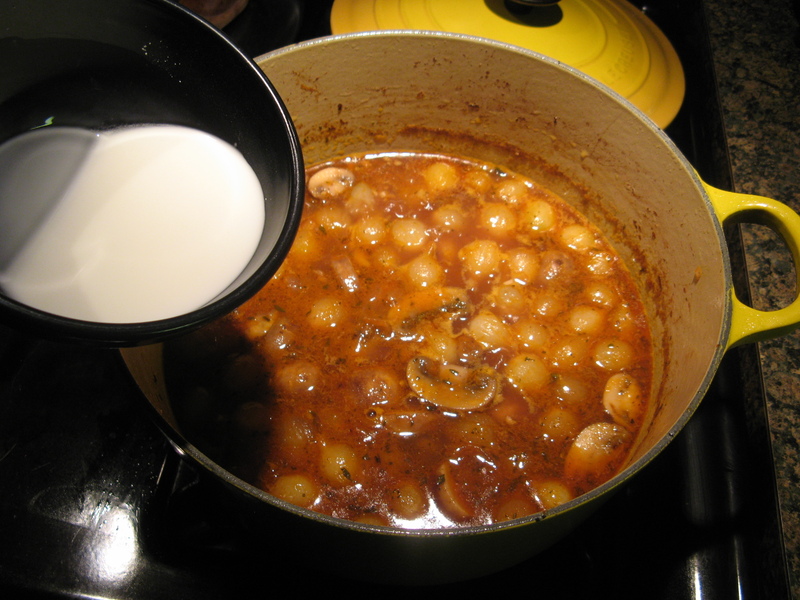 Add the mushrooms and cook for 3 minutes, stirring occasionally. Add in the spinach cook a few more minutes, until the mushrooms are tender and the spinach has wilted, stirring occasionally. 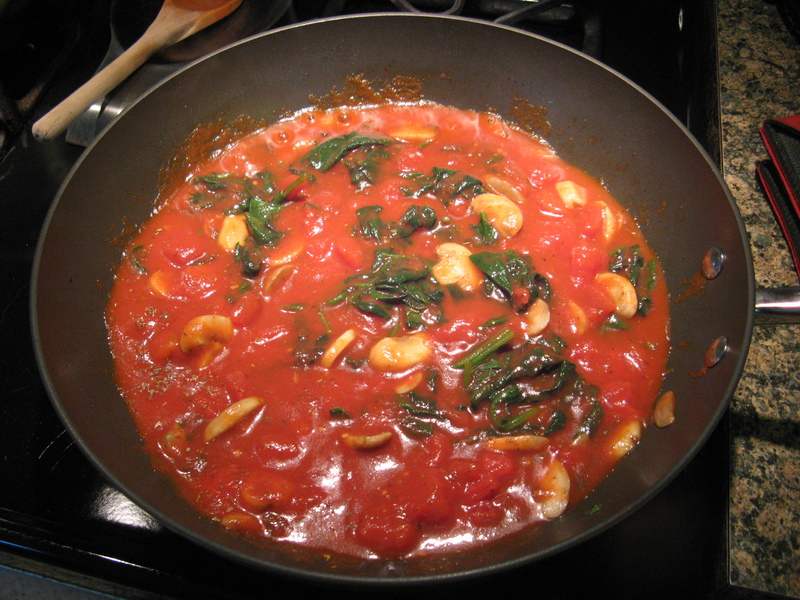 Stir in the undrained tomatoes, tomato sauce, Italian seasoning and salt. Bring to a boil then reduce the heat and simmer for 3 minutes. Combine the ricotta, 1/4 cup parmesan cheese and pepper in a small bowl and set aside. 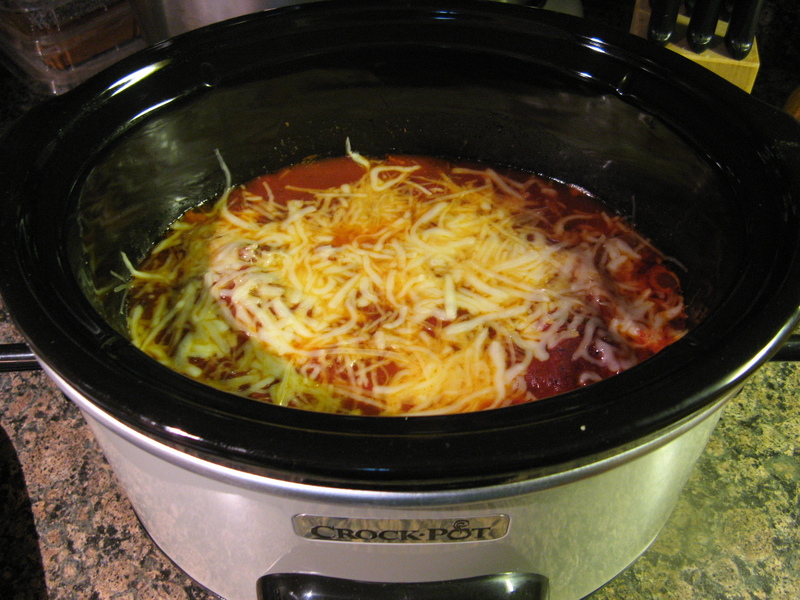 Spread 3/4 cup of the sauce on the bottom of the slow cooker. Layer 3 lasagna shells over it, breaking the shells to hit. Top with 3/4 cup of sauce, ricotta cheese mixture and 1 cup of mozzarella cheese. 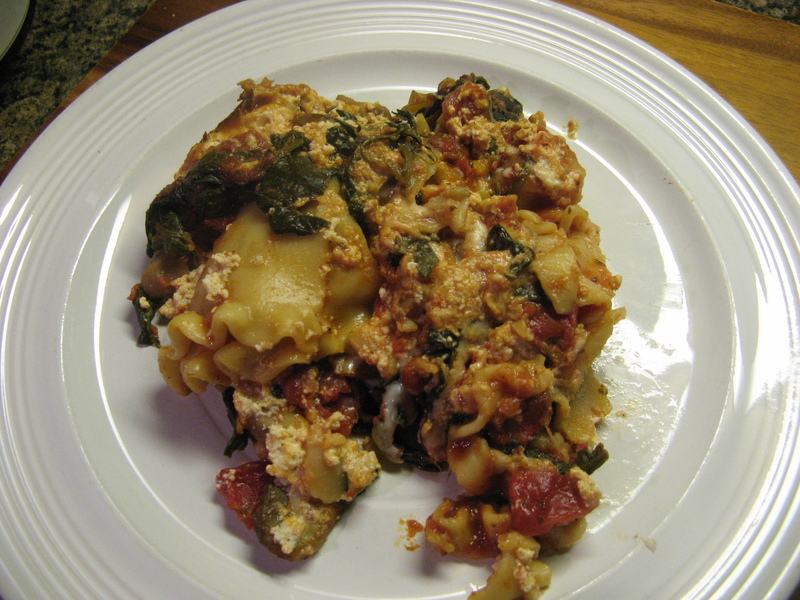 Top with an additional 3/4 cup of sauce and remaining 3 lasagna noodles. Spoon the remaining sauce over the noodles. Cover and cook on low for 5 hours, or until noodles are tender. Sprinkle with remaining parmesan and mozzarella cheeses, cover and let stand for 5 minutes or until the cheeses have melted. Normally when I make Chicken Parmesan it’s because I have leftover breaded cutlets from the night before. I don’t know why, but, it just never crosses my mind to make Chicken Parmesan the same day I am frying up the breaded cutlets. Maybe it’s so I can have something different the following night… leftovers are good but they are even better when you can spruce them up into something different. 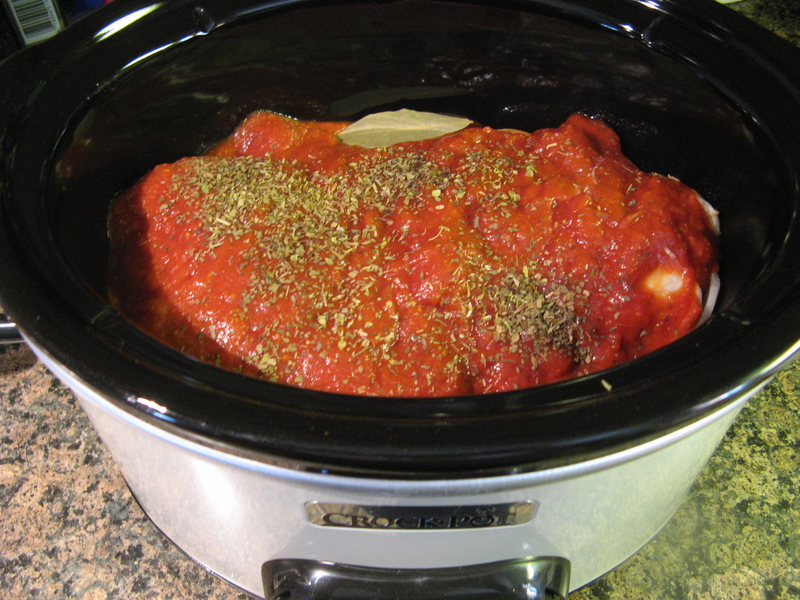 For today’s Slow Cooker Sunday I am bringing you Chicken Parmesan that’s lacking the breading but definitely healthier without it and also because there’s no frying involved and you get some veggies in the mix – mushrooms and onions. 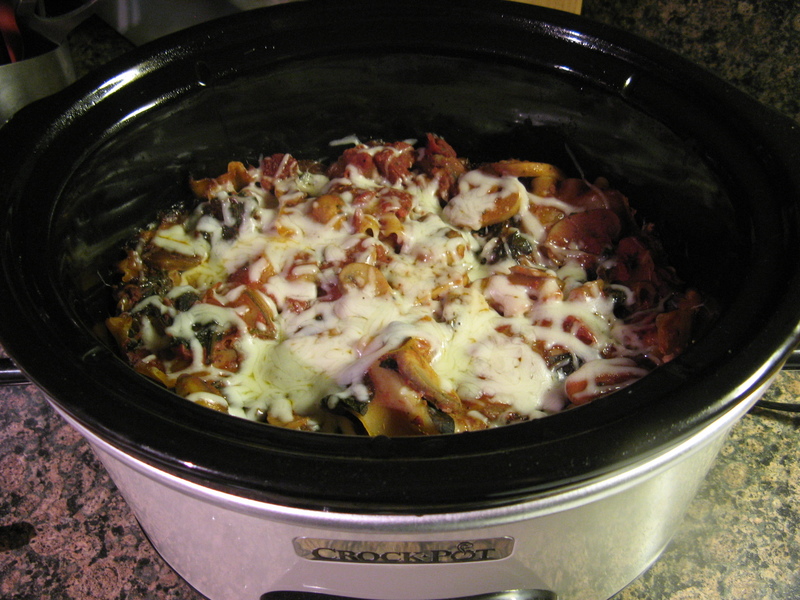 To begin I placed the mushrooms and onions in the bottom of my slow cooker. Next, I placed chicken breasts that I lightly browned on both sides over the vegetables. Following that I poured a jar of pasta sauce over the chicken. You can use your favorite pasta sauce; I used my favorite Francesco Rinaldi Three Cheese Sauce. I then sprinkled dried basil and oregano over it and placed a bay leaf in as well. After cooking it on low for about 7 hours I removed the cover and sprinkled it with parmesan and mozzarella cheeses and left it uncovered for about 15 minutes, until the cheeses were melted. Meanwhile I cooked spaghetti which I served with the chicken. 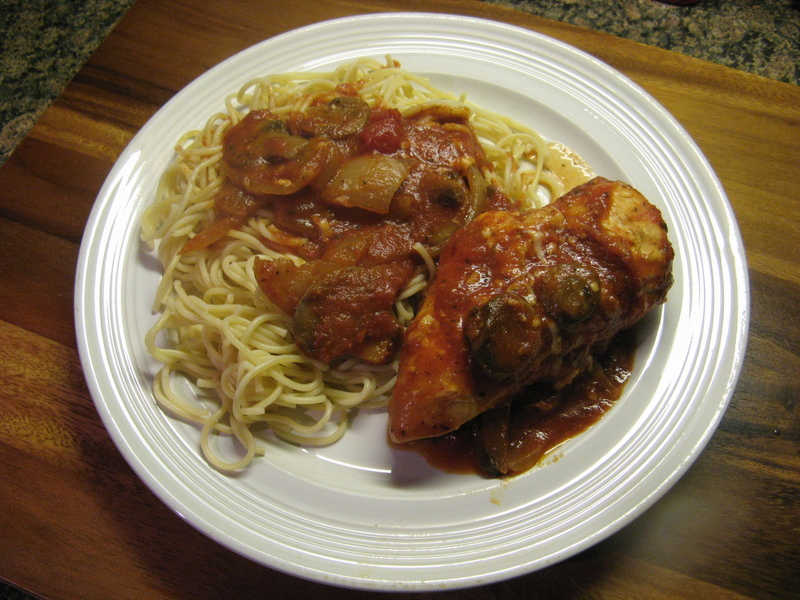 Overall this was a nice alternative to the traditional chicken parmesan and definitely one that I will make again. 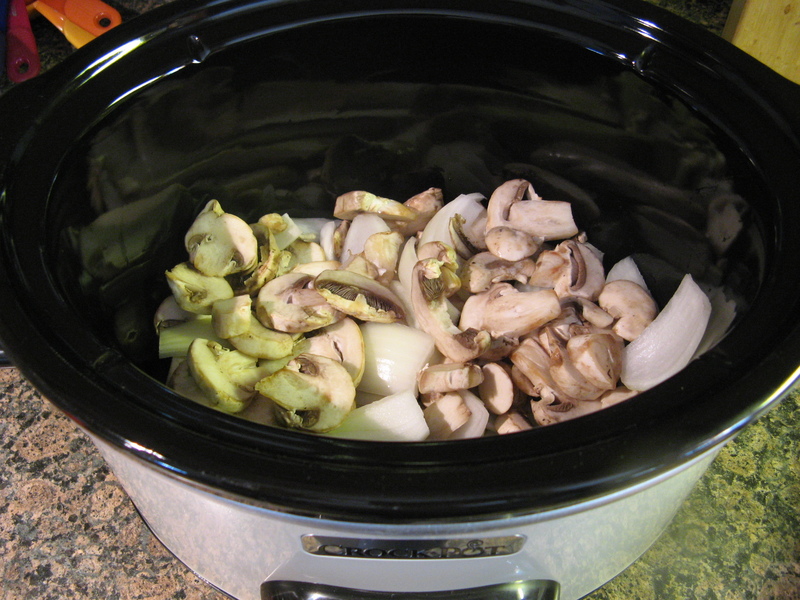 Place the mushrooms and cuts onions in the bottom of a 3 1/2 to 4 quart slow cooker. 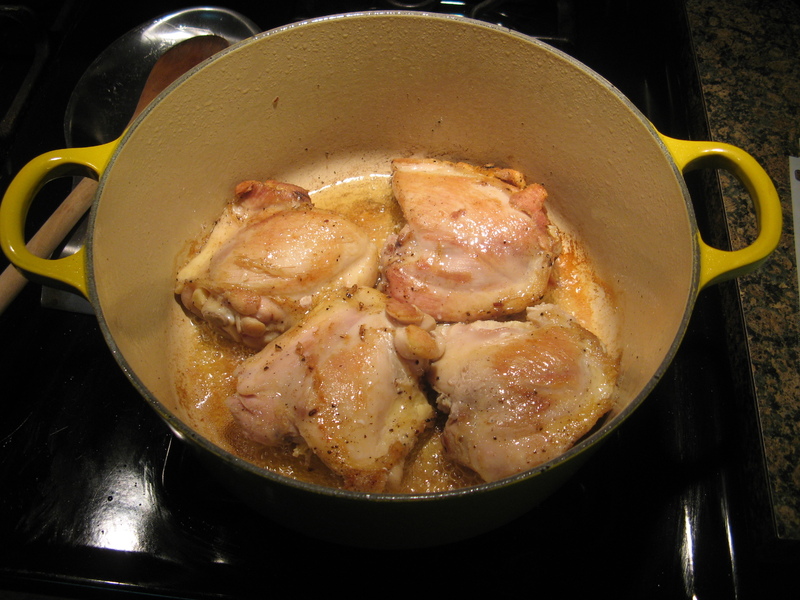 Heat oil in a large skillet over medium-high heat and lightly brown the chicken on both sides. 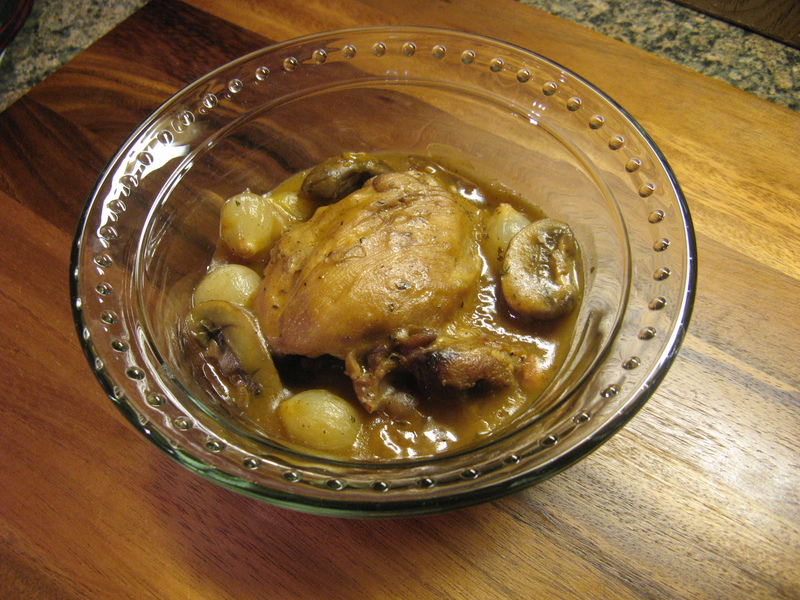 Place the chicken on top of the mushrooms and onions. 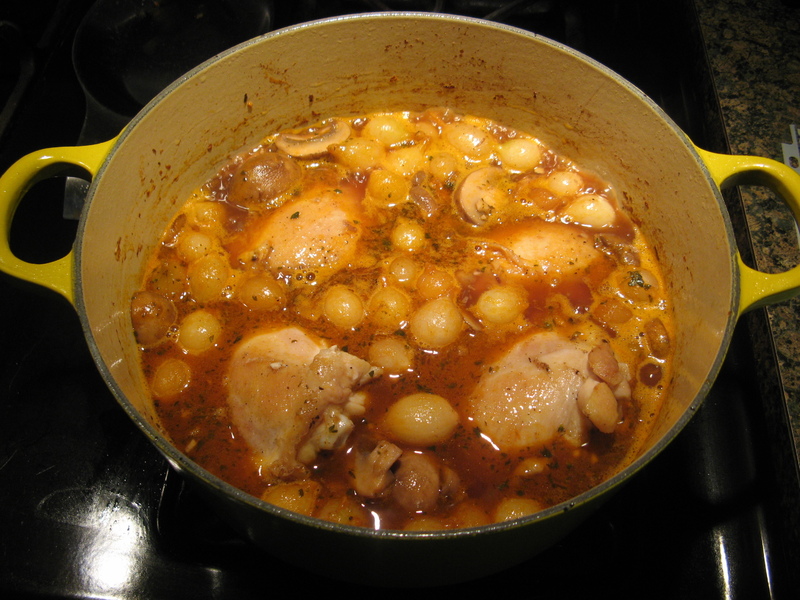 Pour the pasta over the chicken, add the bay leaf and sprinkle the basil and oregano over the sauce. Cover and cook on low 6 to 7 hours or on high 3 to 4 hours. Uncover, remove the bay leaf and sprinkle with the cheeses and leave uncovered on low for an additional 15 to 30 minutes, until the cheeses have melted. Serve over spaghetti. While browsing through my Instagram feed last week I came across a picture that made me stop and double-tap immediately! If you’re on Instagram and you’re not following Foodgawker you should definitely go check them out and start following them. They post amazing pictures of food that you can get the recipes to by visiting their website. And most of the recipes are ones that you can easily make in your home kitchen – which we can all agree is very important! 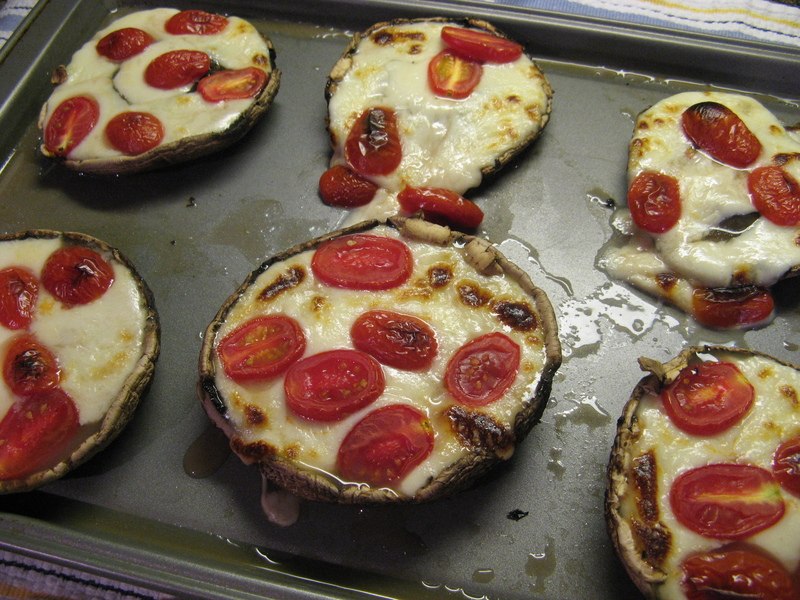 If you love quick recipes, mushrooms, tomatoes and mozzarella this is the recipe for you! And if mushrooms are not your thing – I think it’s something that people either love or hate – but if you love Caprese salad, you may want to think about roasting the mozzarella and tomatoes next time you make it – it really enhances the flavors. 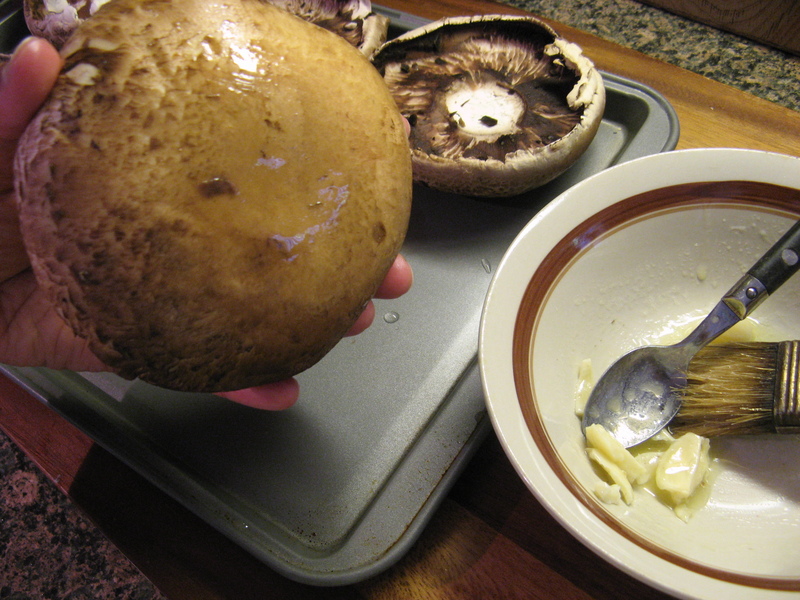 I began by cleaning out the gills of the mushrooms and wiping them with a damp paper towel. To remove the gills I used a small spoon to scoop them out. 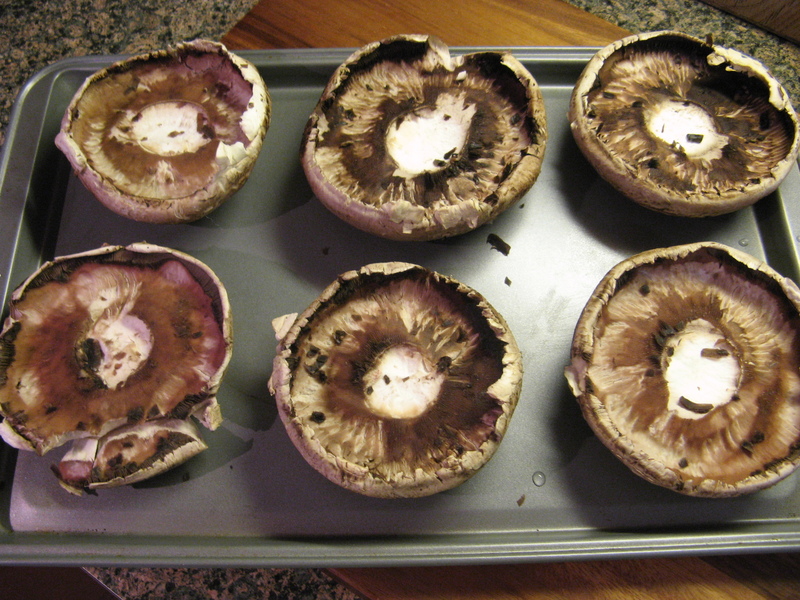 Now, I know there are some people who opt not to clean out the gills, and I did a little research (a quick Google search) as to which is the proper way to eat Portobello’s and it really comes down to personal preference. For me, I prefer them gone because sand could be trapped within the gills and the sand is not going to come out when you cook them and I just think they look “cleaner” when the gills are gone. Next, I melted butter with two cloves of crushed garlic in the microwave and brushed the garlic butter on the bottom of each of the mushrooms. 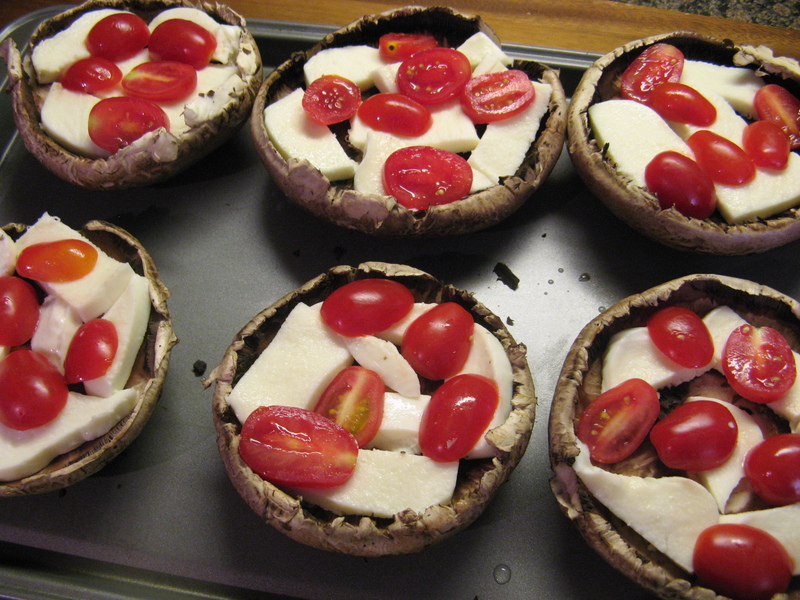 Once the mushrooms were prepped I sliced grape tomatoes and fresh mozzarella into thin slices and placed them inside of the mushrooms. With the broil set to high I placed the mushrooms in the oven and broiled them for about ten minutes, until the cheese was melted and beginning to brown. While the mushrooms were in the oven I made a balsamic glaze to drizzle over them. I combined balsamic vinegar and brown sugar in a small saucepan and brought it to a boil, then reduce the heat and let it simmer until it was reduced by half. Once the mushrooms were done I took them out of the oven and transferred them to a platter and top them with torn basil leaves and the balsamic glaze. These mushrooms were absolutely delicious! Caprese Salad is delicious on its own, but once you roast the tomatoes and bring out some of their sweetness and the mozzarella is melted it’s just a whole other level of delectableness. And the heartiness of the mushroom to go along with it makes this a great main dish with other vegetable or as a quick side. 1. Arrange oven rack to middle of oven and preheat the oven to broil on the high setting. 2. Combine the garlic and butter and melt the butter in the microwave or in small saucepan on medium heat until the garlic becomes fragrant. 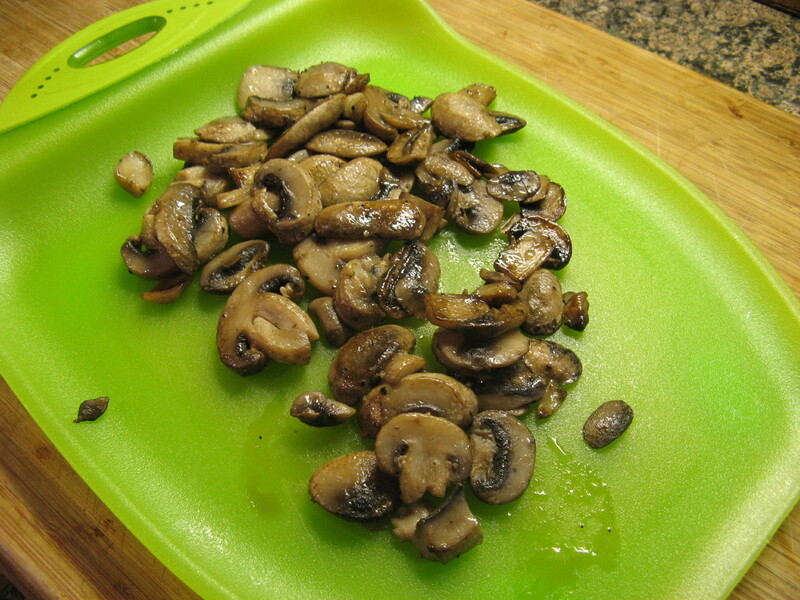 Brush the bottoms of the mushrooms and place them, buttered side down, on a rimmed cookie sheet. 4. 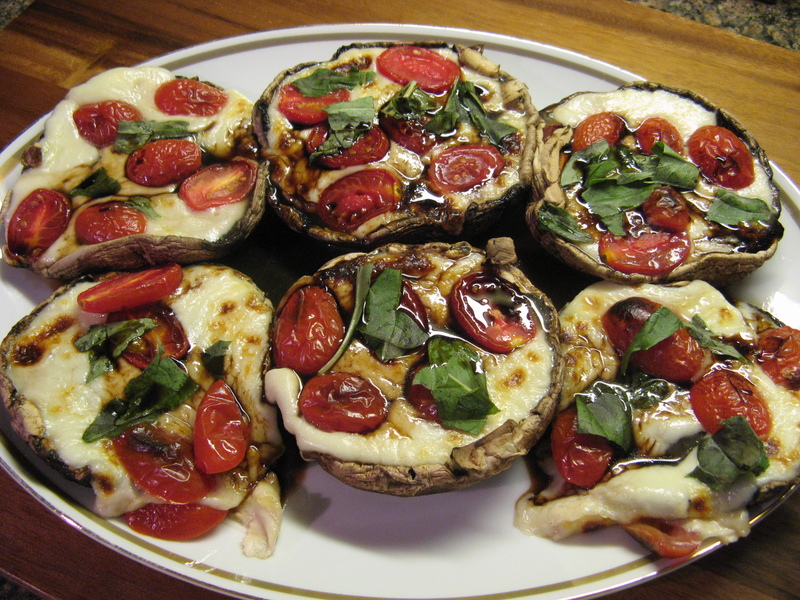 Transfer the mushrooms to a serving dish and top with the basil and drizzle with the balsamic glaze. Sprinkle with kosher salt and fresh ground pepper. Combine the sugar and vinegar in a small saucepan over high heat to bring to a boil. 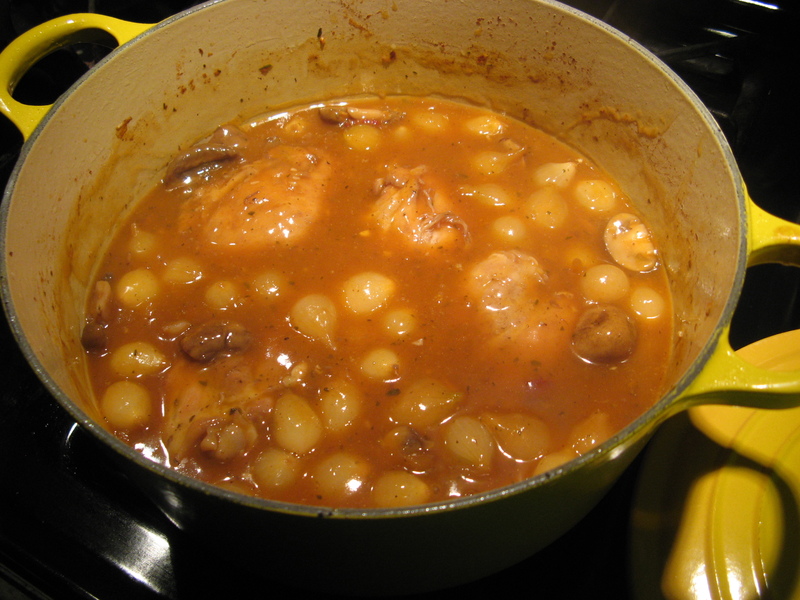 Reduce the heat allowing the mixture to simmer until the mixture has thickened and reduced to a glaze, 5 – 8 minutes. Baking has always come naturally to me, cooking on the other hand is a whole other ballgame. I’m always apprehensive that I will under season or worse over season things, but lately I have become a bit more confident (or maybe I should say comfortable) with my cooking abilities. There is one thing that still frustrates me though… Figuring out what to cook, especially for dinner. As such was the case one day last week. 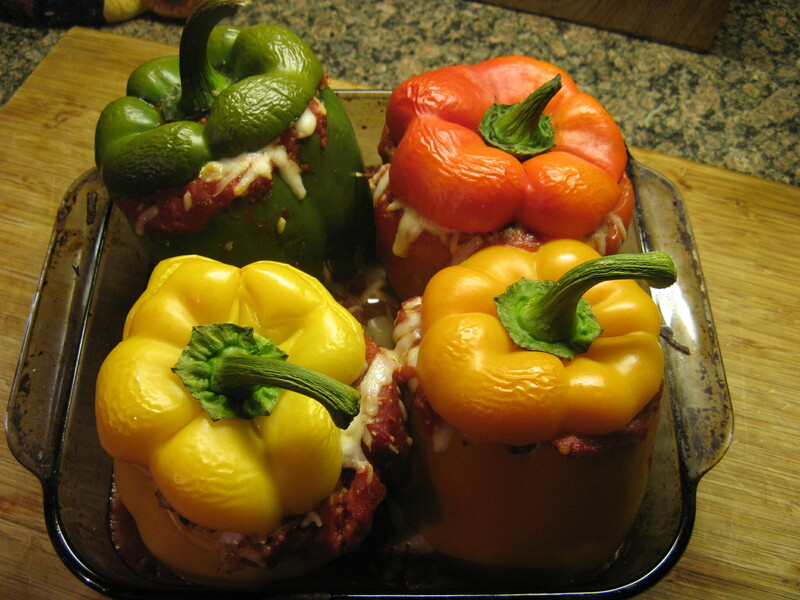 I really was at a lost as to what to make, then while picking up some produce the light bulb in my head turned on and I thought stuffed peppers…. Hence Last Minute Stuffed Peppers. Customarily for a dish like this I would turn to a recipe, but I decided to wing it and create something on my own and a bit from memory from the last time I made them. I began making the filling for the peppers by sautéing sliced mushrooms in olive oil. Once they cooled I chopped them up and placed them in a large bowl. In the same pan I used to sauté the mushrooms I then cooked a pound of ground beef which I seasoned with salt, pepper, garlic and onion powder and half a red onion chopped. 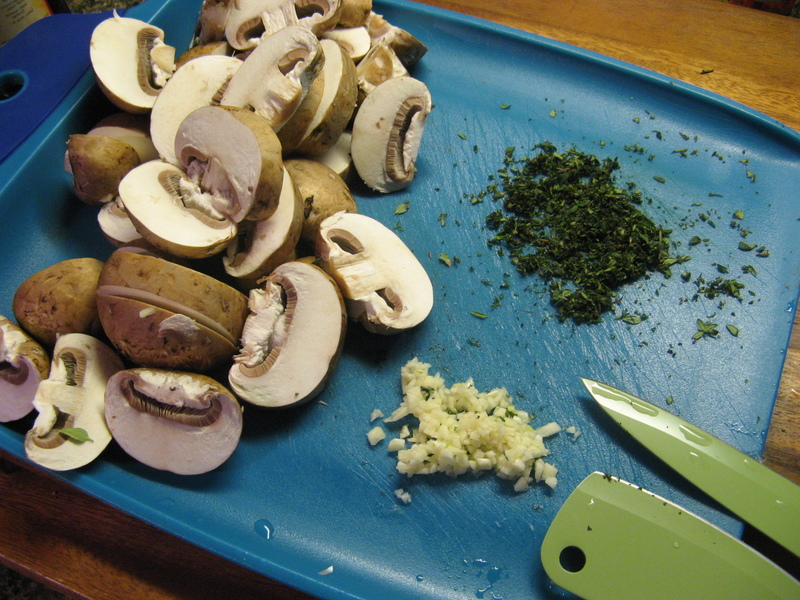 I then added this to the bowl with the mushrooms. 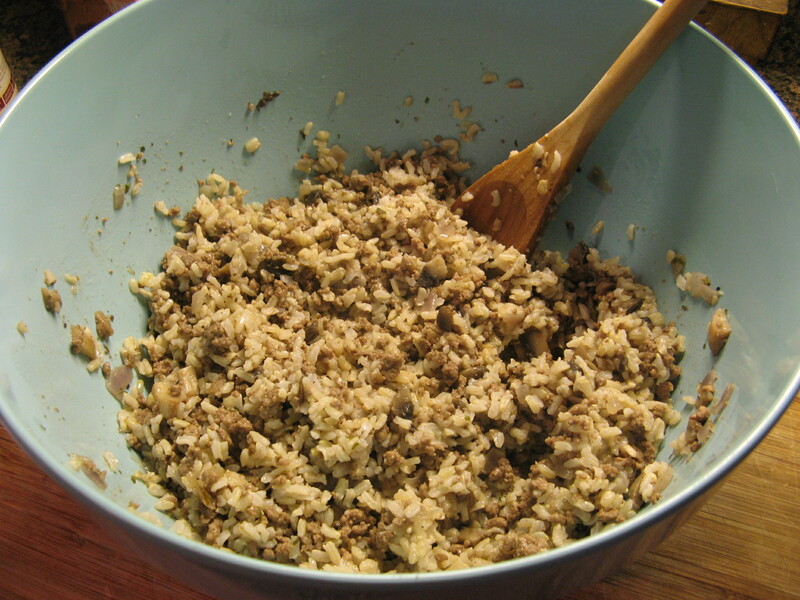 I then added in a cup and a half of cooked brown rice to the mushroom meat mixture. To cook the brown rice I opted to use the 30 Minute Cooking Method; you bring a large pot of water to boil, stir in at most 2 cups of brown rice, bring the water to a boil once again and allow the rice to cook uncovered for 30 minutes. And finally I added in about 1/3 cup of jarred spaghetti sauce and a 1/2 cup of shredded mozzarella cheese to the rice mixture. I mixed it together well and set it aside. Next I prepped the peppers. I sliced the tops off the peppers and cleaned out their insides while I brought a large pot of water to boil. I boiled each of the peppers for about 4-5 minutes. I wanted the peppers to be tender but still a bit rigid so they wouldn’t tear when I stuffed them. I placed them in an 8 x 8 baking dish that I coated with about half of the sauce I had left in the jar. I then filled each of the peppers with the rice-beef mixture and topped them with the rest of the sauce and sprinkled each of them with the remaining shredded mozzarella cheese. And for the final touch I topped each of the peppers with their respective sliced tops. I placed the dish in a 350 F preheated oven for about 20 minutes, until the cheese was melted and I was sure that the filling had enough time to heat through. Prior to enjoying one I sliced it in half and added some of the spaghetti sauce that was in the bottom of the dish. Oh yes, and I added some extra vegetables to this dish by serving it with fresh okra on the side. My Last Minute Stuffed Peppers were delish! Definitely something that I will be making again. And best of all, it gave me a small boost in my cooking confidence. 2. 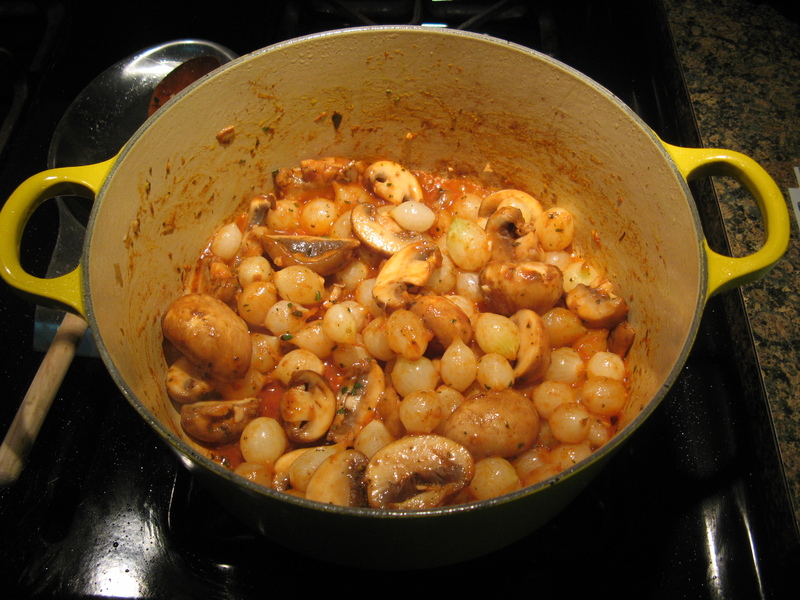 Heat the olive oil in a large skillet over medium-high heat and add the mushrooms. 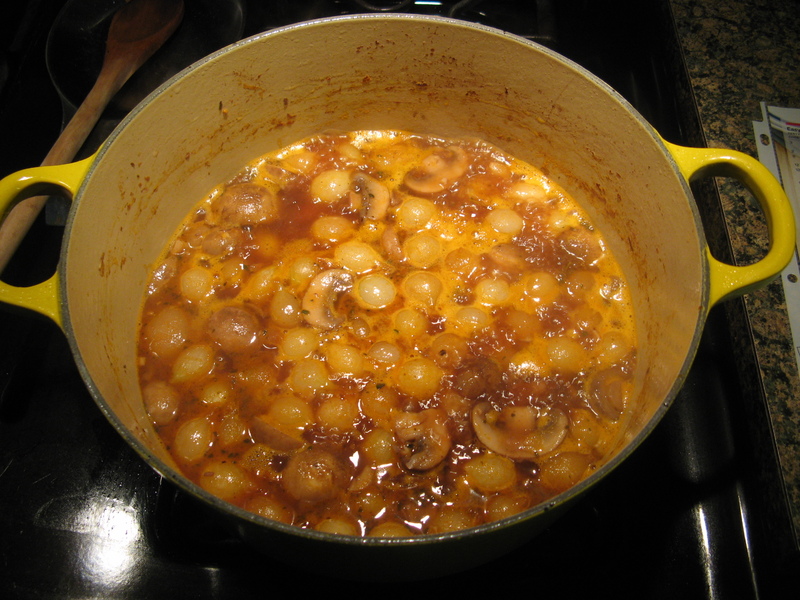 Cook the mushrooms until they are tender and lightly browned, stirring occasionally. 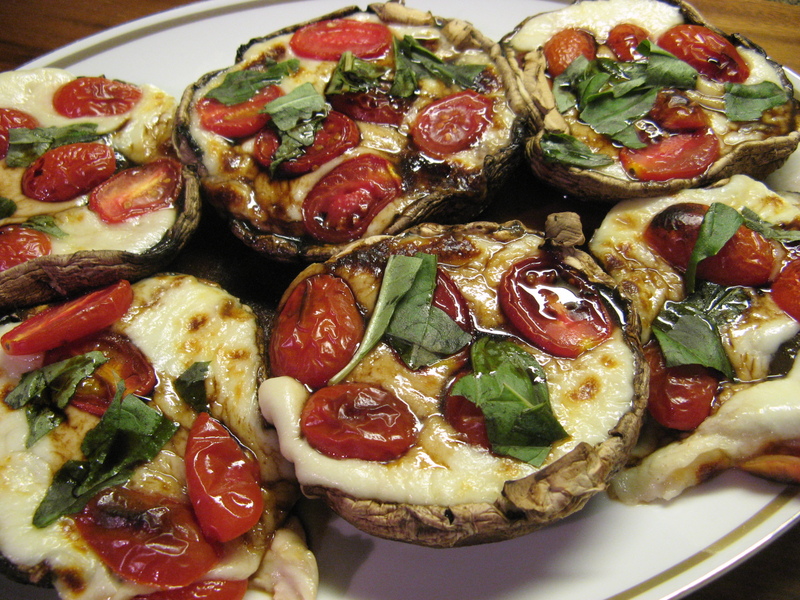 Remove them from the skillet and once they cool chop them up and place them in a large bowl. 3. 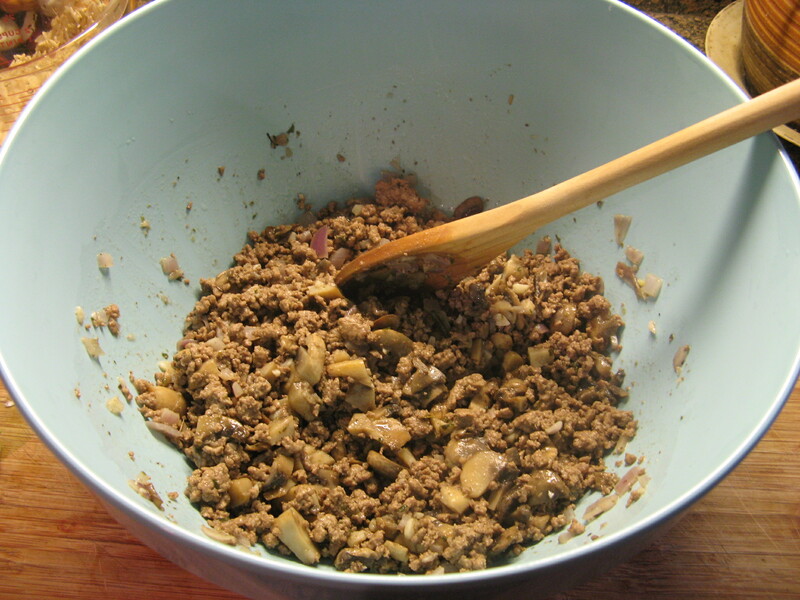 In the same skillet, cook the ground beef along with onion and season with the salt, pepper, onion and garlic powder. Once the beef is cooked add it to the bowl with the mushrooms. 4. 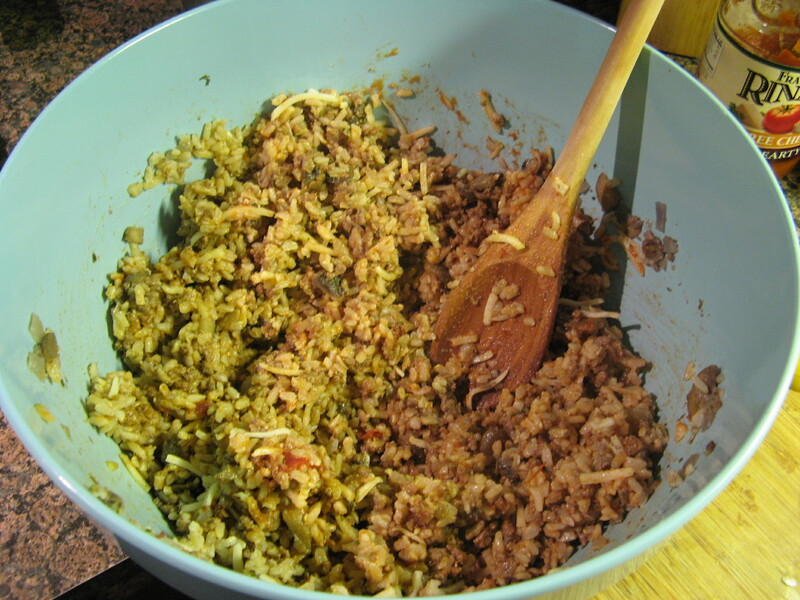 Add the brown rice to the bowl with the beef and mushrooms along with 1/3 cup of the spaghetti sauce and 1/2 cup of the shredded mozzarella. Mix the contents together and set aside. 5. Bring a large pot of water to boil. 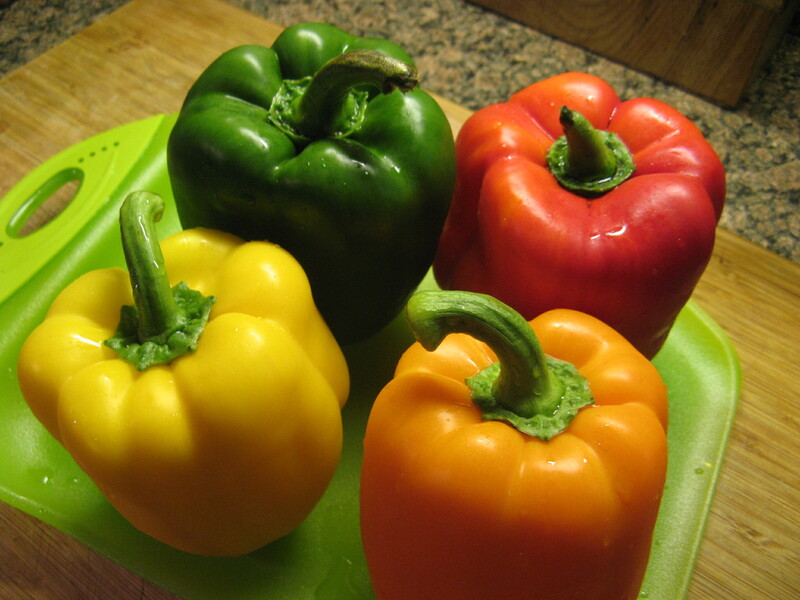 Meanwhile prep the peppers by slicing off their tops (set them aside) and cleaning out their seeds. Once the water is boiling add the peppers and leave them in the water for about 5 minutes; until the peppers are softened but not to the point where they are going to tear when stuffed. 6. Pour about 1/2 of the remaining spaghetti sauce into an 8 x 8 baking dish and then place the peppers in it. 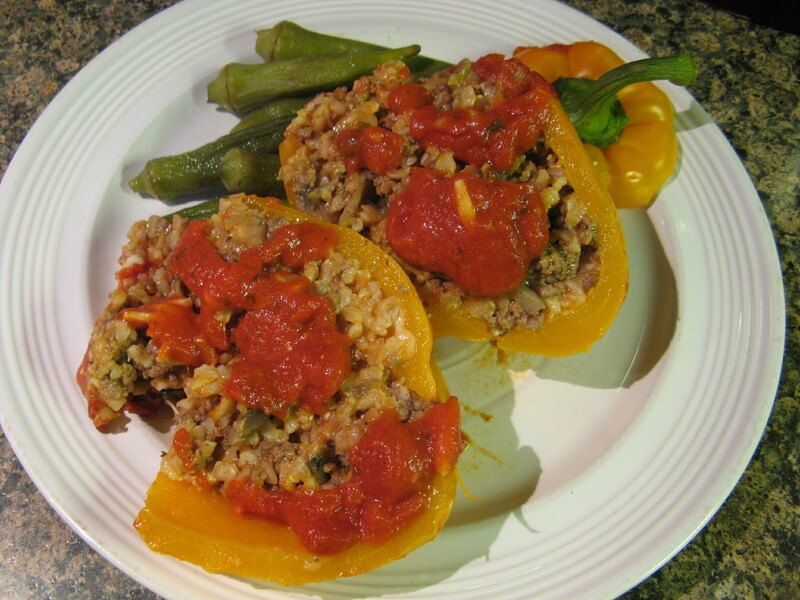 Fill each of the peppers with the rice – beef mixture, filling each of the peppers to the top. 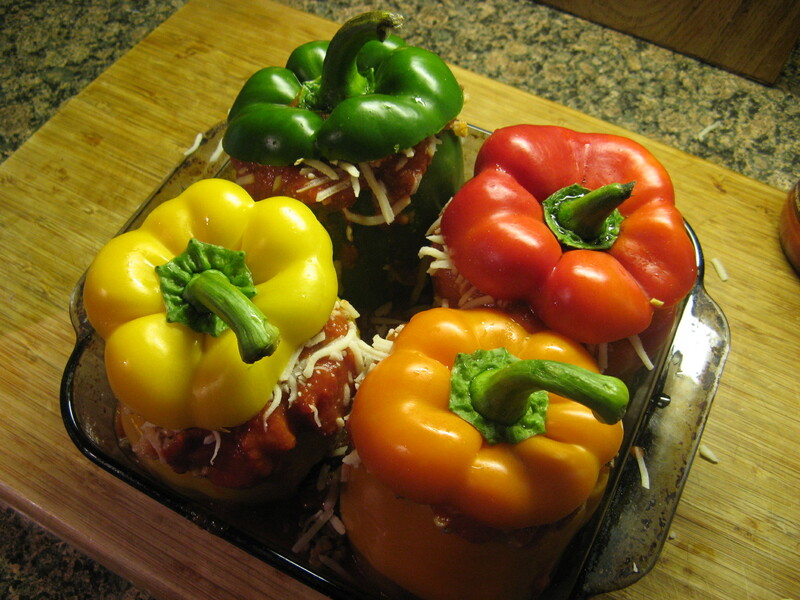 Pour the remaining spaghetti sauce over the peppers and top each of the peppers with the remaining mozzarella cheese. 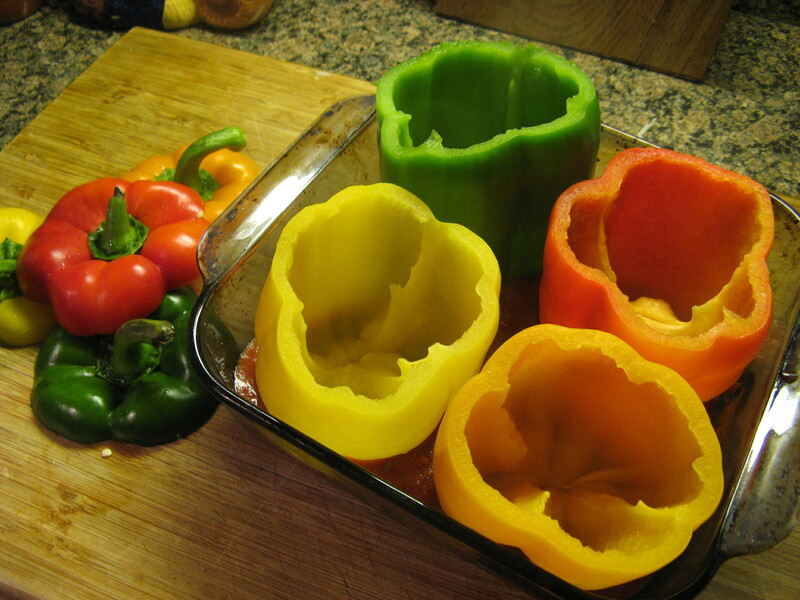 Cover the peppers with their reserved tops and bake them in the oven for 20 minutes, or until the cheese has melted.